As a parent, you know your children's interests better than anyone else. This knowledge can become a powerful motivating force that inspires their reading. Children are attracted to books, magazines, and other print materials that connect to their enjoyable experiences, such as superheroes, wild mustangs, science fiction, the ocean, space exploration, insects, people from other lands and times, and their favorite computer games or game heroes. This is where your knowledge of them comes in. As your child reads more books in high-interest focus areas, the increased depth of the specialized knowledge that they acquire can help them stand out to their teachers and/or peers. Expertise in most areas is respected and can increase their self-image and confidence in taking on other challenges. Here are six tips to help you push through the summer reading slump. Provide casual opportunities for your children to come in contact with reading material about their interests. Keep a variety and rotation of books and magazines around the house related to their interests, and make others available to see which ones they might pick up on the way to acquiring new interests. Powerful images, illustrations, and photos about high-interest topics in magazines such as National Geographic encourage most folks in at least glancing through the text. Curiosity is strong in children, and when not snuffed out by forced assignments with little choice about how they'll learn, quality and compelling reading material can help lure them into connecting with the text. If you read something you select because you know it is of high interest to your child, and if your enjoyment is authentic, let her hear you laugh or make spontaneous comments aloud "to yourself" as you read. By saying, "Wow, I never knew that," you can start a conversation in which your child asks what you read. Don't insist on telling her if she doesn't ask. She's more likely to inquire about your enthusiasm when you don't say, "Here, you’ve got to listen to this." If she doesn't inquire, try leaving the magazine open to the story when you leave the room. That is when she's most likely to follow her curiosity and pick it up to see for herself what was so interesting to you. Visit libraries, used and new bookstores, or online booksellers with your child to help reveal his interests and promote new ones. What captures his attention as he browses the library or bookstore shelves? If he enjoys books about certain topics or by specific authors in the past, ask the librarian for additional suggestions. If he has a favorite book or author, go to an online bookseller that makes suggestions based on past purchases or designated preferences, and look for suggested books that are similar to his favorites. Follow your child's leads with shared reading. Using a book she chooses, perhaps one above her independent reading level, take turns reading together. Have you child read one sentence, paragraph, or page, and then you read the next. If she doesn't like having your jump in with help when stuck on an unfamiliar word, allow her to skim critical sections before reading. This will help her point to words where help is needed. Alternatively, she might prefer to switch with you and have you read the challenging part so that she can read the next section. Any plan is fine as you keep in mind that the goal here is for her to enjoy the reading experiences with you and not participate in a corrective reading lesson. Letting your child's reading errors go unchecked during the reading may be difficult for you, but the reward will be a child who likes to read. If you are still bothered by a few errors that he made in his oral reading, such that you remember the error after you've finished reading together (but don't write these down while he reads -- he will be on to you), you can work on it a little later. Wait until you and your child are doing something else, or until designated homework or study time. Then you can slip in a reading tip and give cues to guide him in the concept he missed. For example, instead of drawing attention to the specific error, consider intervening if he confused the reading of the word "through" with the word "thorough" (a very common error even in mature readers). You could play a version of "Pictionary" by drawing a sketch of, say, someone throwing a ball and then asking what the person in the sketch is doing. Your child says "throwing" a ball. Now ask her to pick which of the words you write that sounds like "throw": is it "thorough" or "through"? After she selects the correct one -- which she will do since she gets two chances -- ask how she can remember which of these two very similar looking words is which. She'll enjoy the challenge and chance to be creative, especially if you do this on a little chalkboard, iPad, or smartphone. 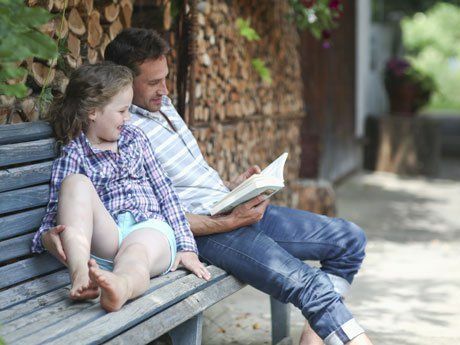 How do you engage your children in summer reading?